Amanda Simmons graduated from Central St Martin’s School of Art & Design with Distinction studying for a Postgraduate Certificate in Glass & Architecture. In 2005, she relocated to Dumfries & Galloway. 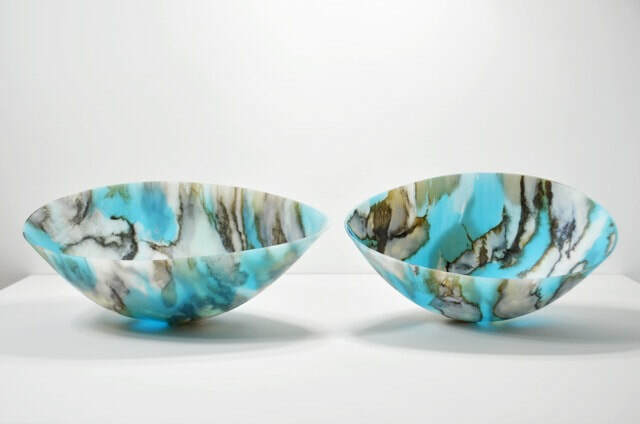 She has exhibited at Collect (Crafts Council) shown by Craft Scotland and CAA, Contemporary Applied Arts (CAA), London Glassblowing, Bullseye Projects in Portland, Bellevue Arts Museum in Washington, SOFA Chicago and Pittsburgh Glass Centre. She makes kilnformed glass vessels, playing with gravity in the kiln. Manipulating mass, heat, colour and time, Amanda aims to create complex, elusive work that has intense colour and pattern, which reacts to the light it is placed in. She finishes her pieces using many cold working processes to shape and mark the glass including sandblasting, hand-lapping, diamond point and wheel cameo engraving. Simmons has been researching John James Audubon (Birds of America) and his life-size paintings of birds, which she has linked with ideas from a residency at Lyth Arts Centre in Caithness where she spent time with research scientists at the Environmental Research Institute in Thurso. She learnt about data modelling to enable engineers to make, and site safely, sea turbines to reduce the impact they have on seabirds in the Pentland Firth. She has also spent time in The Flow Country taking samples and looking at the restorative work of the peat.